This sounds INCREDIBLE to me but I am dying to know if your husband liked it. Mine claims to be open minded about trying new things but I have never seen him order any type of pizza other than some sort of “supreme”!!! 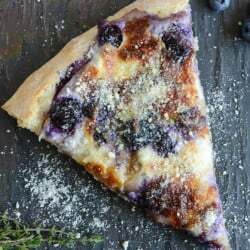 he loved it – he is also not open minded about things like this so if i told him ahead of time i was making blueberry pizza, he wouldn’t touch it. but if i just make it and spring it on him, he tries it and likes it! So I definitely want to make this tomorrow! Dinner date wishes! Had this for dinner. It was so yummy!! i feel your pain. went to a restaurant late and wanted to order their corn shortcake (corn shortcake with sweet corn ice cream and grilled peaches). they’d just closed the kitchen. 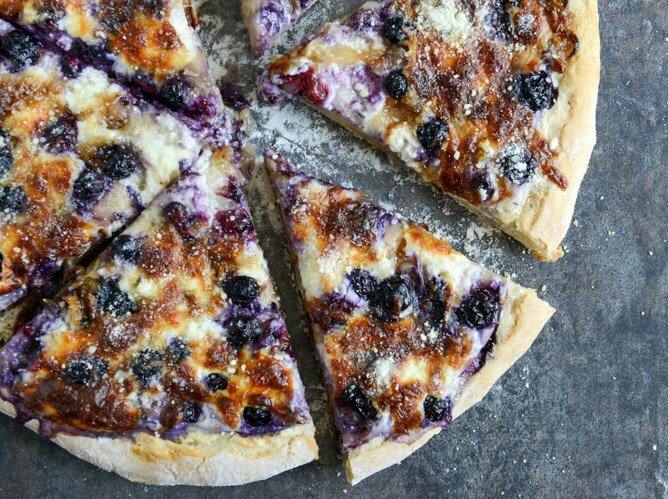 THIS….would be AMAZING with tiny wild blueberries (myrtilles) or cassis….or with pear in the fall….possibly subbing chèvre for the ricotta!….Merci bien! Omg, is this real life?? 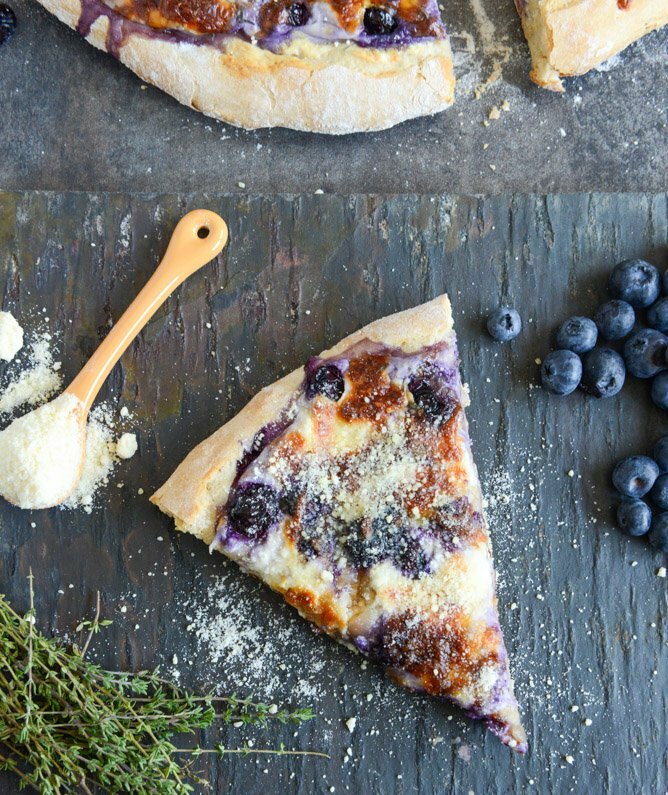 I would never, in my life, ever think of this as a pizza. I would have been right there with you super upset that the restaurant didnt have it for you to try. That is such a bummer. But at least you have the chops to recreate it at home, I bet it’s even better than it would have been at the restaurant! I made your pizza last night, and we loved it! I would definitely make it again! 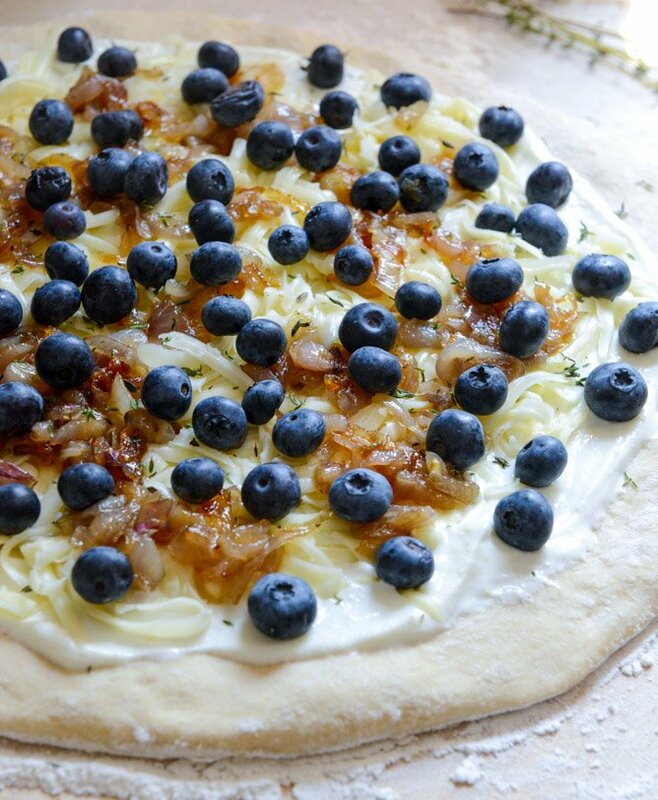 I got a similar pizza from whole foods not long ago though it was bacon blueberry and goat cheese. Amazing! OMG YOU ARE THE GIVER OF LYYYYYYFE. I wanna die for this pizza. Like, wanna try it tomorrow. This is like the exact pizza I’ve been needing but never knew I wanted. I’m throwing a baby shower in a few weeks, and I’m trying to do blue and orange themed foods to match the blue and orange invitations. 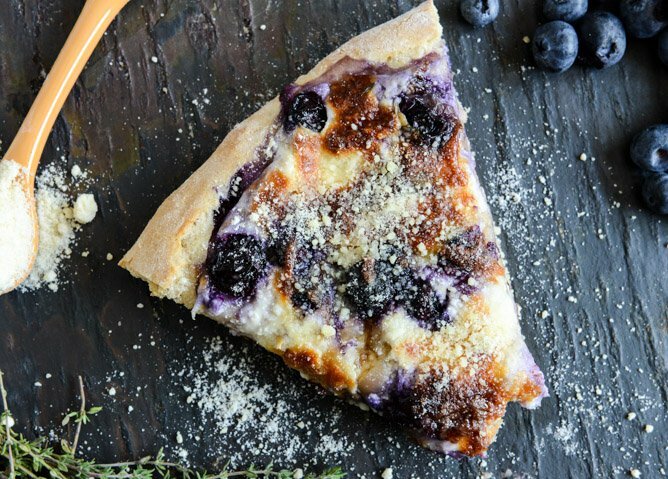 Blueberry pizza is now definitely on the menu! My husband and I were really excited to try this pizza. We followed the recipe exactly and…it was so disappointing :( WAY too much lemon. If we try this again we’ll skip the lemon entirely. Its a great idea, but it could use some modifications. I made this for Easter brunch and it was such a disappointment! I agree with the poster above – I would definitely alter the recipe cutting down on the lemon and thyme. I was hoping it would taste SOMEWHAT sweet, and it didn’t.